Dr. David Thompson was the only surgeon at Bongolo Hospital in the jungles of Gabon. He faced the reality that if he died, or left the mission field, he would leave little legacy and would have made little impact on the great need for surgery in Africa. 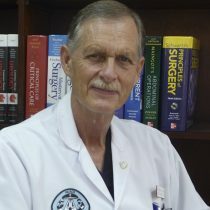 In 1996, at a continuing medical education conference in Kenya, Dr.Thompson shared his vision with a group of missionary surgeons from several African mission hospitals. They responded with enthusiasm and formed a steering committee. Initially ten mission hospitals expressed interest, but then the realities of the magnitude of implementing this vision became evident – only three hospitals were able to start training residents. Sadly, for various reasons, two of the programs had to close shortly. The fledgling program at Bongolo limped on, graduating its first surgeon in 2002. Prior to the graduation of the first fully-trained resident, Loma Linda University had agreed in principle to provide a diploma to PAACS graduates but the loose organizational structure of PAACS was of concern. In response, CMDA created a new organizational concept and PAACS became a council of CMDA in 2001. Loma Linda University has been a valued partner since that time. The first inspection tour of the PAACS system by LLU was made in 2002. In 2003, a partnership was formed with Loma Linda University and the Christian Medical and Dental Associations of the United States(CMDA) to establish a non-denominational Christian organization to train general surgeons in Africa. They called the organization the Pan-African College of Christian Surgeons (PACCS), which was later changed to the Pan-African Academy of Christian Surgeons in 2004. PAACS became a commission of CMDA in 2007. Dr. Thompson still serves with PAACS and in 2013 started another PAACS program in Egypt. PAACS has grown over the years. Nine PAACS African training programs in general surgery are presently active in Gabon, Cameroon, Ethiopia, Niger, Egypt, Tanzania, Kenya (2) and Malawi utilizing ten different hospitals. We also have a pediatric general surgery training program and an orthopedic surgery training program, each at a different Kenyan hospital. The program in Ethiopia is eager to start training orthopedic surgeons and there is a new head and neck fellowship at Mbingo Baptist Hospital in Cameroon. One additional program is presently quiescent in Bangladesh and we are looking at other possible training sites in Africa. Togo is likely to be the next one. Sixty-four surgeons have completed the PAACS surgical training program. All PAACS graduates are currently working in various parts of Africa or have gone for post graduate surgical training. In February 2016, PAACS celebrated its 20th anniversary. God has blessed PAACS! We are truly thankful for his provision and guidance over the years. Visit https://www.paacs.net/about_paacs/our-story/ for more information. This entry was posted in Uncategorized and tagged (PACCS), africa, African, Dr. David Thompson, founder, Gabon, giving back, Health care, hospital, humanitarian, Kenya, nurse, Pan-African College of Christian Surgeons, paying it forward, Philanthropy, Surgeon, Today's Honoree, training program. Bookmark the permalink.